Beautiful beyond belief! This amazing glass shower door set will really complete your bathroom's decoration. The glass is of high quality and comes in either clear or frosted forms, depending on your preference. The ability to adjust the dimensions of the shower door is possible, as well, should you need them to be different. This shower door set is a must-buy! Beautiful beyond belief! This amazing glass shower door set will really complete your bathroom’s decoration. The glass is of high quality and comes in either clear or frosted forms, depending on your preference. 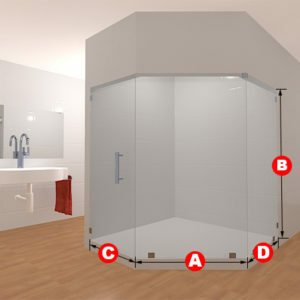 The ability to adjust the dimensions of the shower door is possible, as well, should you need them to be different. This shower door set is a must-buy!